A stop at Five Saints Distilling makes for a spirited visit. First, there are the handcrafted spirits - vodka, bourbon, gin, rum - on sale at the bar. Second there&apos;s the vibrant, upbeat motto of founder-distiller John Robert George. "Life can be an adventure if you let it be," he advises. Third are the namesake "five saints," the father-figures who surrounded his family when his dad passed in 1970. And last, there is a possible ghost wandering around the building. The latter, literal spirit is not surprising. 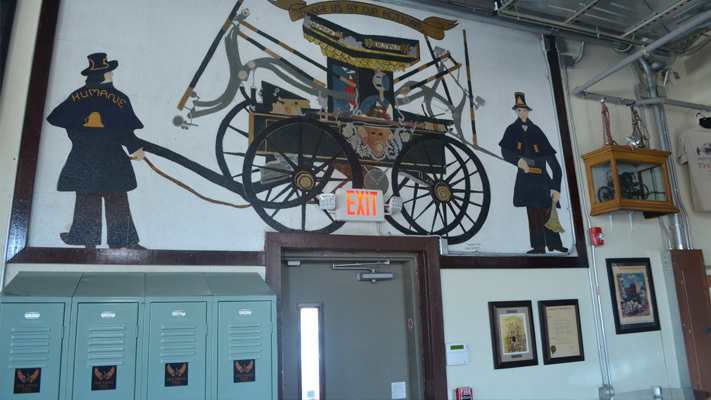 Five Saints Distilling&apos;s tasting room is in the former Humane Fire Engine Company #1, a Norristown landmark on East Main Street since the building was originally dedicated in 1888. The renovation of the first floor is complete, and the staff is fully prepped for the grand opening, July 23, from 11 a.m. to 11 p.m. The garage-style doors have been retained and can be raised to welcome a cooling breeze. The floor that once provided parking for horse-drawn engines now features an attractive bar, a series of high-tops and comfortable group seating. Behind the bar are five photographs, the five saints George credits as being very influential in his life. "Most people have one dad," he explains. "I&apos;ve had five. They represent the hallmarks of how I was raised: community, commitment, quality and family." 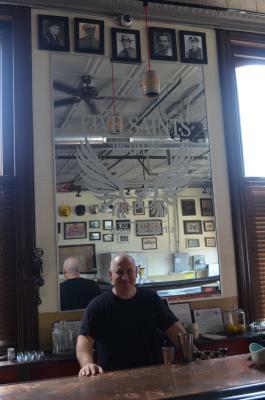 Five Saints Distilling is George&apos;s second career. He retired from the pharmaceutical industry just two weeks ago, capping a 35-year career. When Five Saints set up shop in the former firehouse, the business became the beneficiary of all the location&apos;s history and steward of its artifacts and treasures. 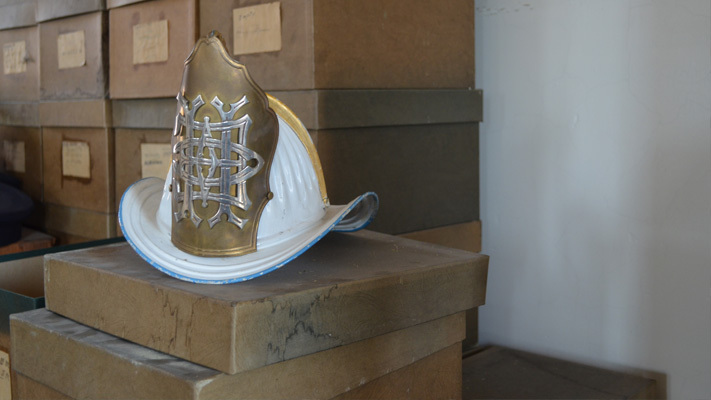 The décor comprises displays of citations, vintage articles, photographs, helmets, equipment and uniforms. Boxed alarm bells still hang from the walls. "The contents were given to us in perpetuity," George says, explaining his role as both distiller and curator. 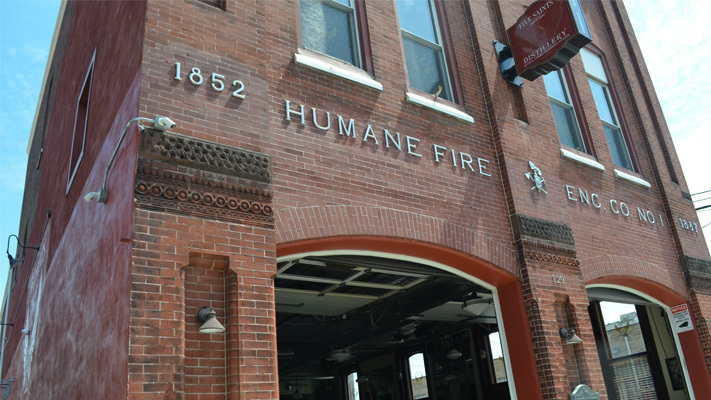 "It was important to the Humane Fire Engine Company that its history be retained. "There were a bunch of proposals for this property over the years: laundromats, body shops. They didn&apos;t&apos; want any of that stuff. It&apos;s a proud heritage. "But they also didn&apos;t have a place to store this stuff. They thought about divvying it up among members, but then it would never be together again. "So that&apos;s what we&apos;re doing." George sums up. "We&apos;re telling the story." Architecturally, the building still has its fireman&apos;s pole, a few remaining gaslight fixtures and a hose tower, a turret once used to dry canvas hoses. The restoration of the first floor is only stage one. A second-floor restaurant and third-floor event space are coming. One of the last spirits George cites is perhaps the remnant of a fireman who once paced these floors, waiting for the clang of an alarm bell before whooshing down the pole. "During the renovations, at night, people on my crew sleep downstairs and hear footsteps up here, where there really wasn&apos;t supposed to be anyone walking around. "When I was here alone and it was late, I kind of made friend with them, and I said, ‘Look, I&apos;m going to be working here late at night. I don&apos;t want to be scared. Let&apos;s be friends." To seal the deal, George promised a few spirits to his spirits. Each time alcohol is distilled, a small amount evaporates off the yield. Traditionally, this loss has been called the angel share. In exchange for a little peace from the afterworld, George offers his ‘angel share&apos; to whoever may still be residing on the upper floors of Five Saints Distilling.